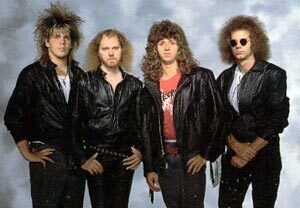 Whitecross was formed in 1986 by Rex Carroll and Scott Wenzel. Whitecross release their debut self-titled CD "Whitecross" on Pure Metal in 1987. Songs like Enough is Enough, Who Will You Follow, and the popular Nagasaki guitar solo by Rex Carroll would bring life to the fast growing scene of Christian Rock and Christian Heavy Metal. Whitecross with is ripping guitar work and solid vocals was often compared to the popular main-stream group RATT. Whitecross followed their debut recording with Whitecross-The $6.98 EP-Love on the Line in 1988, Whitecross-Hammer & Nail in 1988 and Whitecross-Triumphant Return in 1989. Star Song bought the Pure Metal label and the duo of Scott Wenzel and Rex Carroll would create two more albums together. White Cross-In the Kingdom in 1991 and White Cross-High Gear in 1992. The Dove Award winning Whitecross who travel with notable groups such as Stryper, Steve Taylor and others would never be the same again. Rex Carroll the guitar mastermind, songwriter and producer behind the band Whitecross would leave in 1992 to pursue a solo album entitled Rex Carroll-The Session. Rex also went on to form the band King James with front man Jimi Bennett and 2 former members of Stryper, Tim Gaines and Robert Sweet. Scott went on to make a solo album as well as other other Whitecross albums, Unveiled, Equilibrium, FlyTrap, One More Encore.